I believe in the power of prayer. Prayer helped Nathan Dorje overcome insurmontable (1 in 20 million) odds for survival. Thanks to the prayers of friends, family, and strangers around the world, Nathan is in this world to share his love and happiness. Today I beg for your help again. 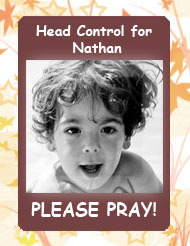 Today I ask that you pray for Head Control for Nathan. Nathan’s inability to consistently support his head has caused him many difficulties. There are many things he wants to do, many skills he’d have a chance of mastering, if he could only gain the ability to control his head. We have tried everything – every therapy we have found, dietary supplements, braces and devices. And still it is an immense struggle for him. So I come to you for help. If many people throughout the world can pray to God, Buddha, Allah, Jehovah – whoever they believe in – to help this little boy specifically to control his head – I am sure Nathan will receive powerful help. My hope is to dedicate 2010 to this goal of head control for Nathan – which I believe he can achieve with all of your help. 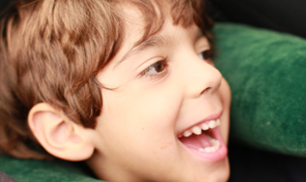 If you want to learn more about Nathan, you can read his STORY here.